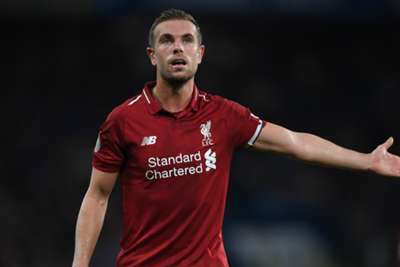 Jurgen Klopp is hopeful Jordan Henderson will avoid becoming the latest first-team regular on Liverpool's injury list following his early withdrawal on Saturday. England midfielder Henderson reportedly experienced hamstring tightness before being replaced at half-time of the narrow 1-0 win away to Huddersfield Town. Naby Keita and Sadio Mane missed the match with hamstring and hand issues respectively while Mohamed Salah, James Milner and Virgil van Dijk all started under injury clouds. The visitors ultimately secured three hard-earned points thank to Salah's first-half strike, with Henderson's fitness now the focus in the wake of a taxing international break. "I hope so," Klopp told reporters when asked if the skipper's substitution was precautionary. "It was not that he felt nothing but he didn't feel a lot. He wanted to carry on – that's a good sign. We decided no. Hopefully it's nothing." A sixth clean sheet of the campaign formed the basis of a battling victory which kept Liverpool level on points with Manchester City, although Klopp was not entirely satisfied. 3 - This is just the third time in English top-flight history as many as three teams are unbeaten after nine league games - Liverpool have been one of them each time (1978-79 and 1990-91). Seldom. "The result is good. I knew it would be difficult after the international break as it always is," he said. "I'm not angry or whatever, but I think we should expect of ourselves to do better. We expect from ourselves really good football and I like to see that. "The basis we've created so far is brilliant: 23 points, I don't think I've had that before after nine games. And still space for improvement [which is] good as well." Klopp went on to express sympathy for close friend David Wagner and admiration for his "very good" Huddersfield outfit. The Terriers boss was similarly upbeat despite being left with a fifth successive home blank and just three points from a winless start. "It's the truth that we have problems with scoring goals, but it's also the truth that we perform at a very high level," Wagner said. "We have the passion and desire to limit a side like Liverpool. "We were able to create opportunities against opponents of different levels and that's what I'm focused on. The goals will come."